Scoil Sinéad Limited is looking for expression of interest from parents/guardians who would like to have a Post Primary School in their area under our patronage. Scoil Sinéad was granted trustee patron of the first post primary school we applied for under this patronage thanks to the volunteers and the parents that voted for us. This was down to parents believing in our model. The patronage process is down to parental preferences and as such you the parents have the control to enable us to be patrons of these schools. If you are interested please fill in the attached information and we will keep you updated on when the patronage process has started in your area. Please note submitting this expression of interest information to Scoil Sinéad is not admission to the school if our patronage bid is successful. Under GDPR only the Scoil Sinéad Limited Director and Secretary will have access to the information. The Department of Education and skills have rolled out the new Online Patronage Process System (OPPS). This process allows parents to vote for their preferred patron for the four new Post-Primary Schools to be opened in September 2019. Parents and Guardians with children who will be attending post-primary school between 2019 to 2023 born between 2006 and 2011 and live in the specified areas identified by the Department of Education is eligible to vote. Scoil Sinéad believes that all children should learn at their own pace and their own learning style and not conform to any one method. Being involved in the community and developing our community is a big part of our curriculum aiming to show how important every job is to the development of the community and show the children all the options they have in their lives. We aim to nourish and give children the tools they need so that they can use their individual talents and abilities to make their community great. Scoil Sinéad's ethos is that every child has a right to an education no matter their social economy, religion, ethnic background or their abilities. Please help us to achieve this goal VOTE for Scoil Sinéad. Scoil Sinead has a multi-denominational ethos, but the huge backing for it was not only about religion: its 697 name count was more than 10 times the number gathered by Dublin and Dun Laoghaire Education and Training Board (DDETB), also a multi-denominational patron. 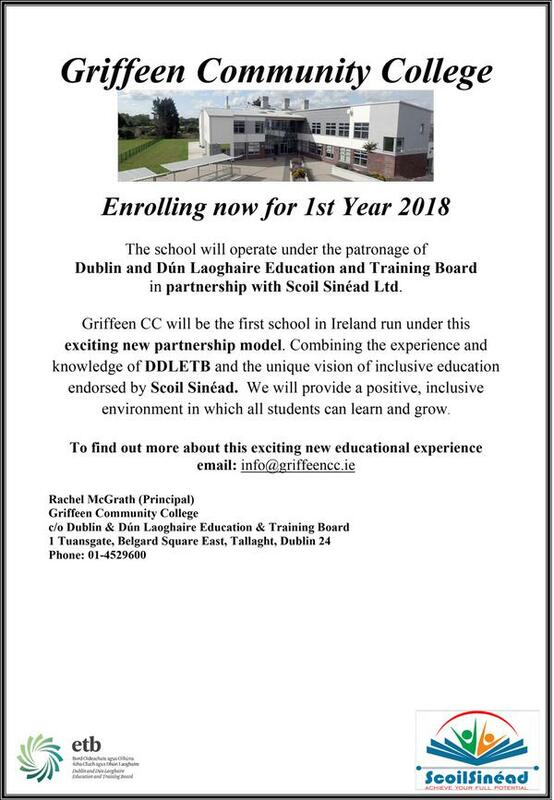 Griffeen CC will be the first school in Ireland run under this exciting new partnership model. Combining the experience and knowledge of Dublin & Dún Laoghaire Education & Training Board (DDLETB) and the unique vision of inclusive education endorsed by Scoil Sinéad. Student centred and focused on developing 21st century skills.